We are nearing the end of Week 3 of the second annual Birmingham Strava Shootout. Basically, we pick a different climb each week and then see who can get the fastest time up the climb. Mark Fisher has been crushing it (and crushing a lot of my KOMs along the way) so when he laid down another smoking fast time yesterday crushing by 20 seconds my KOM on the long version of the Smyer climb, I knew that I was going to give it everything I had to get back the KOM today. I did a new version of the endless Vestavia climb at a really easy pace to get nearly an hour of warm-up in before my KOM attempt. I came into the KOM from the top so I dropped all my stuff off (water bottles, tools, pump, food, iphone, etc…) behind the rock shown in the picture above. Then I drilled it down the descent to keep my legs loose and ready to go at the turnaround at the bottom. I forgot to look ahead of time to see what wattage I should be able to maintain for 6 minutes, but I guessed it should be around 425 watts. I made the final decision on that wattage as I was descending and kept telling myself not to go too hard at the beginning. As narrated in the video, I started out by looking at the wrong wattage number (3s wattage which happened to be 370watts at the moment when I looked instead of the Lap wattage which was actually 470 watts at that point). After I figured out that I had looked at the wrong wattage number, I settled into a good rhythm backing off my initial pace so that the power average drifted back down towards 425 watts. The last time I looked at my wattage was near the Brookwood Metro back entrance road where the wattage average had dropped to just below 450 watts. I looked at my average speed a few seconds later as I turned onto Smyer and I had a solid 18.8mph average through that point. This gave me a ton of motivation because I was expecting to be closer to 18 flat and was afraid that I would even be under 18 based on the fact that I was trying to be more conservative through the opening part of the climb. Up ahead I could see two other riders side by side as they entered the switchback portion of the climb. I was on them really quickly and had to pass them on the wrong side of the road because there was no time to yell and wait for them to get out of the way. Fortunately, I had a clear view through the switchback and was able to pass them very quickly and get back onto my side of the road. There was a good tailwind through the 280 overlook section so I entered the flat section before the next set of switchbacks with a ton of speed. I got a bit overconfident at this point as I tried to hammer through the next switchbacks in too big a gear leading to quite a bit of bogging down. I upshifted into an easier gear at the Hurricane Ivan landslide/washout area to try to get back on top of a gear and proceeded to nail the deepest pothole in the washout. I happened to look down and see my time as I rounded the last turn before the straightaway leading to Shades Crest, and I saw a time of 4:00 or maybe it was 4:05. This caused a lot of mental anxiety/consternation because up until that point I felt really good about my prospects of getting the KOM, but when I saw that I was already up to 4 minutes, I wasn’t sure if that was going to leave me enough time to get to the top. I don’t normally ever look at the time through that section so I had no clue how much time was left in the climb. Those thoughts/doubts were quickly dismissed as I saw a group of riders strung out climbing up from the steep portion of Shades Crest Rd crossing the intersection that I was barreling towards at 20mph. Normally, you have to time the merger to slide into the road either in front of or behind cars that are coming up the hill. The still image screenshot in the video at the top of this post is a picture of that intersection (Shades Crest is the road coming up the hill from the left). If I wasn’t digging so deep, then I probably would have laughed at the irony of having to time that intersection based on riders coming up the hill instead of cars. I found a hole to dive into and then passed the rider who I had slid in behind. He cheered me on as I came flying by, and that helped motivate me to push it really hard through the sharp steep turn onto Smyer Circle and then the flatter drawn-out ending of the climb. When I hit the lap timer button, I saw 5’55” and I was about ready to fall off my bike. It’s funny, too, because I was really trying to discipline myself to maintain a 425 watt average throughout the climb instead of starting out too hard and then watching the power drift down. I ended up hitting my 425 watt target wattage exactly even though I cannot recall ever looking at my wattage again after passing the Brookwood Metro entrance. Speaking of wattage, when I loaded this ride into Golden Cheetah, I first noticed that my effort was indeed a new maximum that extended all the way to the edge of the critical power curve. But then I noticed that my CP curve had been dropped from 305 watts down to 293 watts. I’m guessing that this has something to do with a better fit to the curve. The good news is that this shift in the curve means that I theoretically have a lot of “wattage-room” to take back the shorter KOMs on Old Montgomery and Big Momma that Mark got the last couple weeks. But it seems strange that my new curve predicts a new, lower 1 hour wattage of exactly 300watts instead of the previous prediction of 315watts based on the new 293 CP wattage vs the old 305 CP wattage. Can any power/golden cheetah/critical power experts out there weigh in on how this ride would cause my curve to shift? I’ve included three screenshots below that show my CP curve before updating with the Old Montgomery KOM effort, after updating with the Smyer effort, and then one that shows the CP curve with today’s Smyer effort in black before Golden Cheetah had updated the CP curve. Thanks! Smyer KOM lap summary data (click to enlarge). I thought it was interesting that my xPow (normative power) was lower than my average power. I’m pretty sure I was pedaling the entire time so I’m not sure why there is a difference between normalized power and average power? Finally, I’ve posted screenshots from the ride and also taken some screenshots from the video showcasing the beautiful fall colors. These are in the gallery below. Enjoy! Trees in the lower switchbacks near the speedbump. 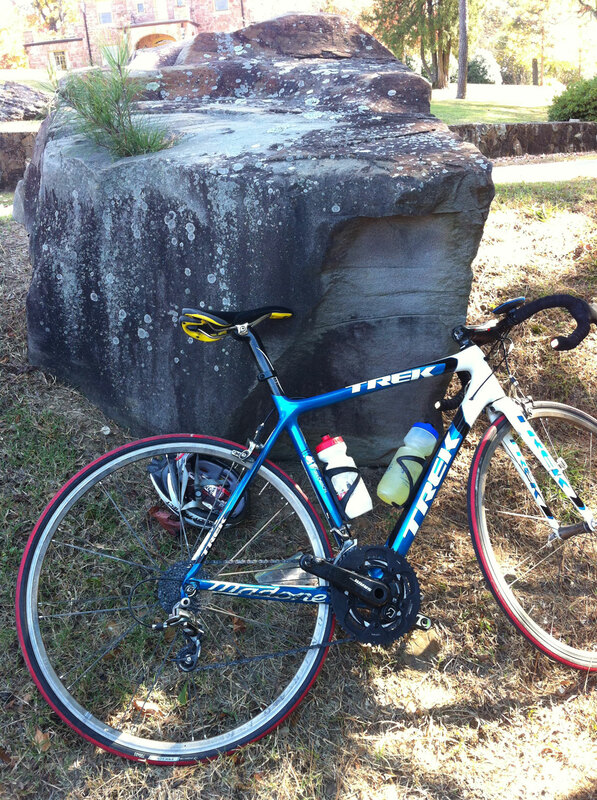 This entry was posted in Training and tagged kom, power, strava on November 3, 2012 by kartoone. My attempt at the Alabama State Time Trial last week shortly after having some pretty bad food poisoning went really poorly. I had been looking forward to comparing my time with what I had done two years ago, so today I put my clip-on bars back onto the bike and swapped out to my Reynolds Wheels so that I could try again. I picked a relatively flat route to get all the way out there to Columbiana since it was going to be a long ride in the heat. But showers this morning, cloudy skies, and rain still in the air brought the temp way down to 70s and 80s for most of the ride. When I finally made it out to the high school, I put my foot down on the start line, hit the lap button and took off. I initially set a target wattage of 300 watts, but I felt good and kept the average (including the initial surge from the start line) closer to 325 watts for the first few miles. Watts were gradually dropping from my average as I tried to keep my current wattage close to 300 on the flatter sections and 400+ on the steep rollers. On the downhills, though, I didn’t want to spin like crazy so I just let the power drop to the low 200s. At the turnaround, I still had a 310 watt average and 24.5mph speed average so that gave me confidence to push it hard on the way back to keep a 300+ watt average for my effort. I ended up setting a half hour’s worth of power records along the way. My time ended up being just over 58 minutes, which I believe would have put me into 3rd or 4th place in the Pro/1/2 category. Definitely redeems the miserable 1 hour, 17 minute effort last week. This course is really a great time trial course for criterium racers b/c you can take advantage of the steep hills to use your upper body strength and give your legs a bit of a break. And since you are only going 10-15mph on the steeper hills, the aerodynamic penalty of rocking the bike back and forth doesn’t matter so much. Of course, if you have a disc wheel, large front chainring and full aero setup, you might be able to carry enough momentum on the steep downhills to top out some of the rollers. This entry was posted in Training and tagged power, time trial on July 7, 2012 by kartoone.